After months of dreaming about shirtdresses, I think I finally made one that I am really really going to enjoy wearing. This Bleached Marigold Dress is another example of my love of taking a good pattern and mixing it up with a whole lot of DIY. 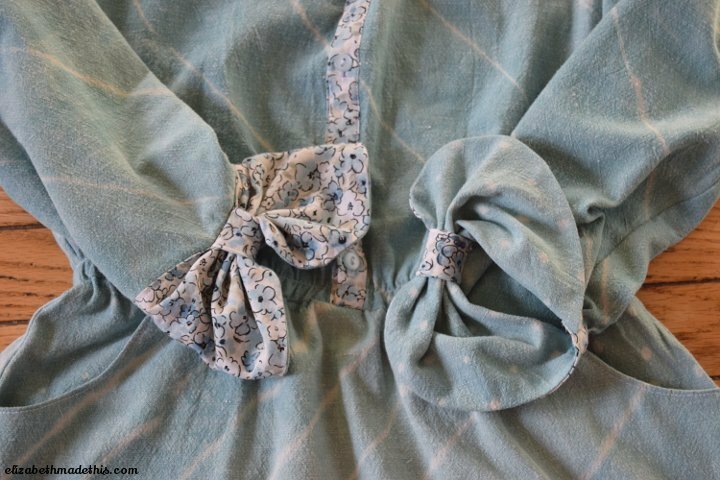 I started with a cotton/linen curtain panel that was this denim colored chambray. I loved the fabric, but the color was just a little off for me–too intense and too cool for me. But I kept coming back to the fabric. It has such a beautiful weight to it, perfect for a dress, perfect for Blank Slate Pattern’s Marigold Dress. I also find linen impossible to walk past, especially when it’s at the thrift store. It feels like I’ve just struck gold…well, maybe not that dramatic, but it’s still exciting. My goal was to test out some bleach on it, and if it worked, great, and if it didn’t, I’d be more than happy to save it for pants for the boys. I put about a cup of bleach in my washer in hot water and tossed in the curtain. I let it soak for maybe 15 minutes then I ran it through the cycle. The bleach took out some of the intensity and yellowed it a bit, making it much more appropriate for my coloring. 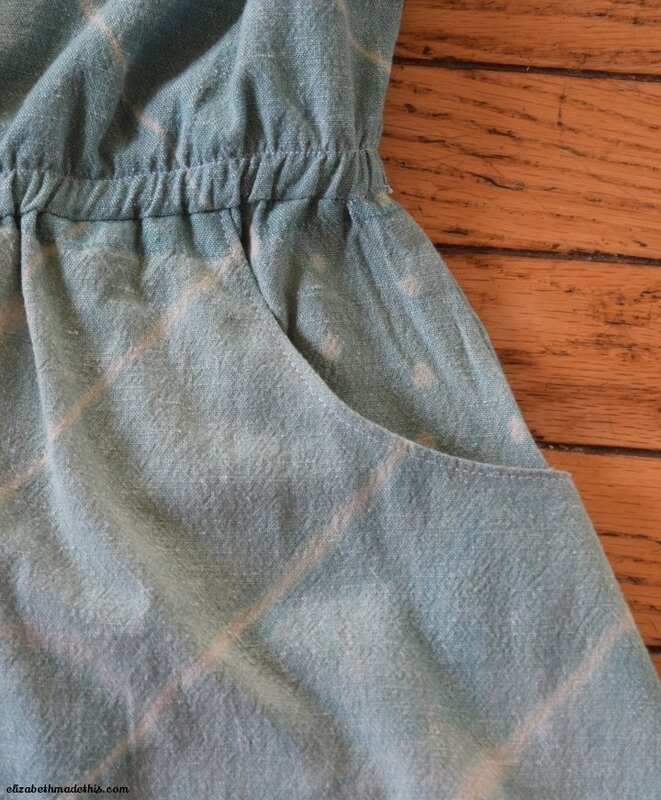 To my surprise, the bleach also didn’t destroy the overall chambray effect of the cross threads, and the fabric maintains it’s visual chambray look. Because I was working with limited yardage (43″X85″), I knew I’d need to use another fabric for contrast. I plumbed the depths of my stash and came up empty, so I went to stash #2–my own old clothes and found this floral batiste top I made as a beginner. It might have been my first Burda pattern. I always loved the fabric, but the boxy fit with overbust gathers never suited my style or body type well, so it got buried under other clothes. But low, and behold, it matched the bleached fabric really well. I was going to go ahead and cut the bleached fabric as is, but I got to thinking about the bleach and how well this fabric took to it, and decided to experiment with a bleach pen. 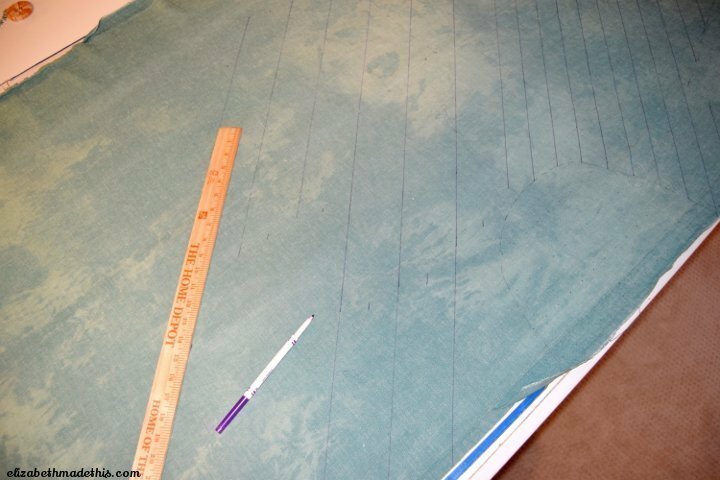 I knew once I got to the point of bleaching the fabric, I’d have to move quickly, so I traced out lines on my curtain panel with a washable marker. The lines run on the bias down the fabric. I laid out my pieces on the fabric before hand because there were two areas where I wanted to use polka dots instead of stripes–the pockets and the cuff facings. Setting out my fabric on a shower curtain liner, I quickly went over my lines (and dots) with the bleach pen. I was really, really glad that I had taken the time to draw the lines with the marker first because I learned that the bleach pen is A) difficult to control perfectly and B) works very very quickly to discharge the dye. From start to finish, this process took about 10 minutes, so there was very little time to dilly dally. I plunged it in a solution of hydrogen peroxide and water to help neutralize the bleach before I washed the fabric. You can use other chemicals to neutralize the bleach. This Threads article recommends Bleach Stop or Anti Chlor (though the author herself preferred vinegar which was not recommended on other sites I was reading). I had hydrogen peroxide on hand, it’s cheap, and very non toxic, so I felt really comfortable choosing that. I did have to cut everything in a single layer, which took a little more time, but not a ton, and I was rewarded with chevrons down the side. The sleeves have little bow cuffs made per a tutorial on Melly Sews. Because of my limited yardage and because I wanted the inside contrast on the sleeve to be the polka dot fabric, I sewed on the bow portion of the sleeve as a cuff instead of an faced, shaped extension to the sleeve as it is in the tutorial. The combination of the batiste and the bleached fabric makes for a cuff with the most beautiful body to it. I wasn’t sure I was going to like the style of the bow, but it actually ends up yielding a much more functional sleeve for me. Shirts with cuffs stay cuffed on me for precisely 3 minutes, after which point, I’m tugging and yanking on them and rolling them up. Because cuffs are fitted by nature, when you roll them up, it always feels a little confining. And if I’m in the kitchen, a cuffed sleeve becomes like a straight jacket. The bow allows for more movement and hits me at a place where I don’t feel the need to cuff up. 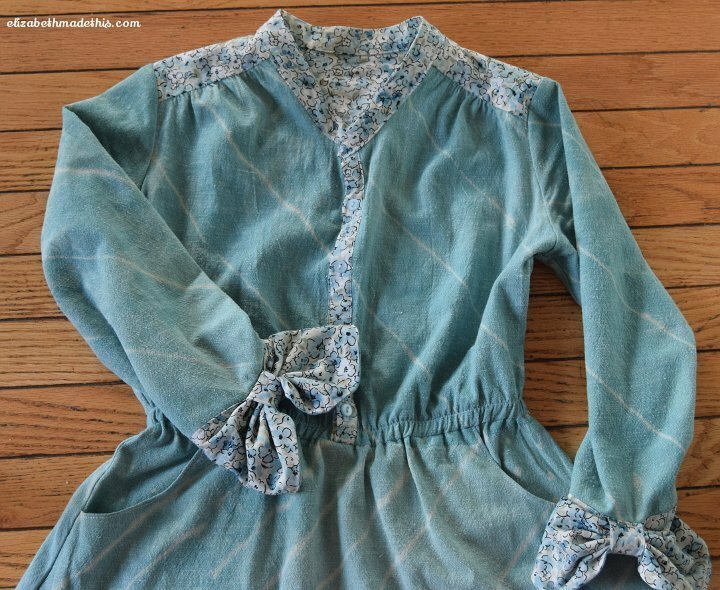 Besides the bow cuffs, the floral batiste makes up the button bands, the collar, and the yoke. I really do like how these two fabrics look together. The whole dress feels a bit cowgirl to me in the best possible way. Only now, away from my Houston upbringing since college, do I regret never having bought a real pair of boots in Texas. Although a 3/4 sleeved dress is maybe not the best choice for summer, I know this will be a great dress to have available come fall and spring. Shirtdresses forever! What about you? Have you made a shirtdress of late–is it a style that makes you jump with glee? I love this dress! You’ve done a wonderful job. Wow! What you did with that fabric was awesome. 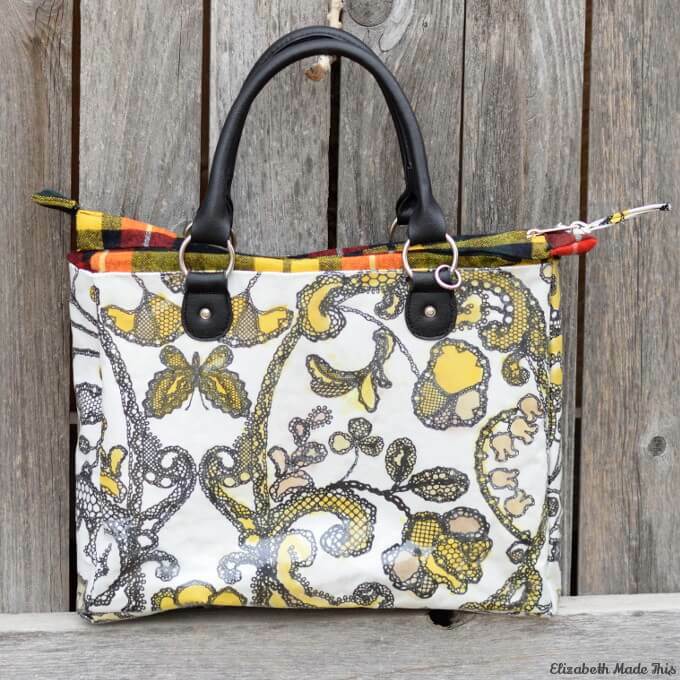 I love the liberty cotton accents to. Simply wonderful. I’ve been itching for a shirt dress too. I might try that pattern. Hmmmm. Thank you! I love the shirt dress style, and I like that this one is more fitted at the waist than most…that’s definitely hard to find in a pattern. Great dress! I love what you did with the fabric and the floral is the perfect contrast! Thanks! I’m glad it worked out. Working with bleach is always a big gamble. The time you spent on the fabric was well worth it–it’s so much more memorable of a dress now. The stripe placement is great, too! Thanks! It was a fun sew. One again you have blown me away with the details! I love the idea of the bleach pen and the stripe placement is genius. Thanks Helena! It was fun to mess with the pattern placement, and this will not be the last time that I reach for a bleach pen!